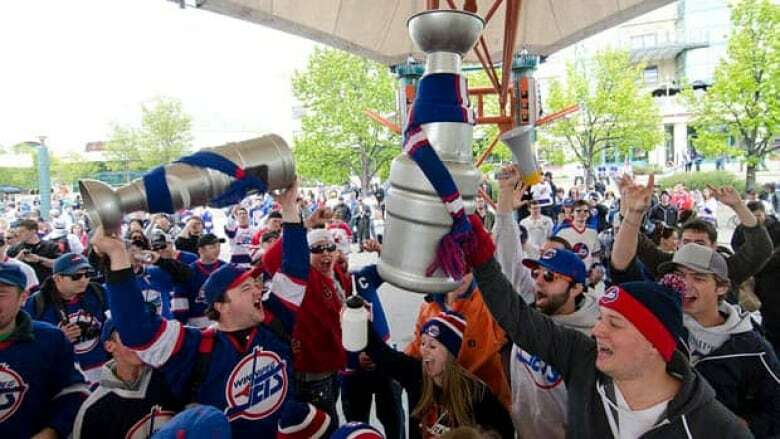 Winnipeg's new NHL team reached its goal of selling 13,000 season tickets just minutes after they went on sale to the general public on Saturday, and days after packages were made available to selected customers. Winnipeg's new NHL team has reached its goal of selling 13,000 season tickets. The number was made on Saturday, just minutes after tickets went on sale to the general public at noon local time. "Officially Sold out! Reached our goal within 17 minutes of noon. THANK YOU!!!!" said a post on the ticket campaign's official Twitter account. Organizers said later that the online queue for purchasing tickets was actually full in two minutes, with the remaining 15 minutes required to process the sales. Jim Ludlow, the president & CEO of the ownership group True North Sports & Entertainment, thanked fans in a statement. "We would like to take a special moment to thank all of our fans in Winnipeg, Manitoba, and Canada for their support over the past week — in particular, the overwhelming response of our fans which has resulted in a successful 'Drive to 13,000' campaign," Ludlow said. "The success of the campaign is a key ingredient to ensuring the sustainability and long-term viability of NHL hockey in this province. "We look forward to seeing everyone this fall at MTS Centre for opening night of regular-season NHL hockey in Winnipeg." NHL commissioner Gary Bettman said he was impressed by how quickly the tickets sold out. "While I had no doubt the 'Drive to 13,000' would reach its destination, the remarkable speed at which it got there certifies the fans' hunger for NHL hockey and their commitment to True North's initiatives," Bettman said in a statement. A waiting list for fans unable to secure season tickets was set up on the website driveto13.com, with a non-refundable deposit of $50 per seat required to join the list, but it sold out quickly, too. The 8,000-ticket cap on the waiting list had been reached by Saturday afternoon. Hockey fan Phil Sitko said it took some doing, but he was able to get his season tickets in Saturday's online sale. "I had to try 30, 35 times. Constantly refreshing, constantly re-checking," Sitko said. "There was a scary part when the screen completely went black. I thought the entire site went down. And the next try after that, it kicked in and I got the ticket." The as-yet unnamed NHL team was bought by True North from owners in Atlanta and the company was hoping to sell 13,000 season seats ahead of the NHL's vote on the approval of the sale later this month. True North was already more than halfway to its goal before tickets went on sale to the public Saturday, as more than 7,100 season ticket packages were snapped up over the previous three days in a pre-sale for season-ticket holders of the AHL's Manitoba Moose. Ludlow said on Friday that he didn't expect it to take long for the rest to go. "There's lots of anticipation, seems to be a lot of demand," Ludlow said. "It could go fairly quickly." While the pre-sale was brisk, Ludlow said the team made sure there were some season seats left for the general public by putting a cap on the number of tickets Moose fans could buy. There was no lining up for tickets. All purchases had to be made online. With all 13,000 season tickets sold, that leaves just over 2,000 tickets for each game at the MTS Centre. It is the NHL's smallest arena, holding just over 15,000 people. But unlike the old Winnipeg Arena, where the Winnipeg Jets used to play before they left in 1996, MTS Centre has corporate suites, ranging in price from $105,000 to $197,000 a season. Those help fatten the club's bottom line. Ludlow didn't provide any hints about what the new team will be called nor exactly when the name will be announced, but he said it won't be long. CBC News reported earlier this week that the name would be revealed after the conclusion of the season-ticket drive. Many fans would like to see the return of the Jets name. Other names bandied about include the Manitoba Falcons, which would assuage those who live outside Winnipeg and feel the name should reflect the province as a whole, and pay homage to Canada's first Olympic gold-winning hockey team, the 1920 Winnipeg Falcons.